When that spark ignites inside your brain for a new product, service, business, etc. Often you jump straight into branding or logo design. Maybe you start by designing your product itself. Each one of us lean more toward one of these approaches, but the truth is: if you aren't designing your business with your buyer's needs, wants, problems, and desires in mind... the best you can hope for is to just be successful by accident. "If you aren't designing your business with your buyer's needs, wants, problems, and desires in mind... the best you can hope for is to just be successful by accident." When we work with our clients on growing their business and reaching a larger audience, it is very common that they are missing that empathetic connection to their customer that would allow them to exponentially grow their audience. That's precisely the reason why we developed The Offer Bridge. 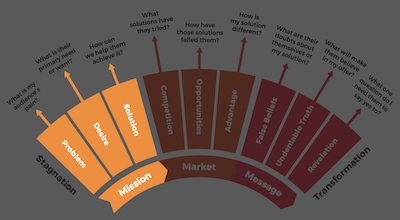 It has been an invaluable tool for us to help our clients (and ourselves) visualize how our customers are feeling at various stages of the buyer's journey, what problems or doubts they are experiencing, and how we can provide them with a solution to help make their lives better. How is The Offer Bridge laid out? 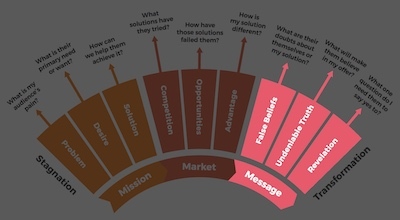 The offer bridge depicts a customer's journey from a stranger with no solution to their problems (Stagnation) all the way to a buyer who's problem or pain point has been changed into a goal or desire achieved (Transformation). On this journey, you will need to ask yourself various questions about how they're feeling, what kind of doubts they might be having, and how you can best serve them. The bridge is comprised of three main segments: Mission, Market, and Message. Each of those segments is divided into 3 parts that help you identify the primary questions you must answer for that portion of your customer's journey. Let's take a look at the different sections of the Offer Bridge. The Mission segment of the offer bridge is where we identify what product or service we will be developing in order to serve our audience. In order to find your business's mission, you must always start by thinking about the Problem or primary pain point hat your audience has. If you bypass this part of the offer bridge, you run the risk of creating a product that no customers will want or need simply because they won't be able to understand what value it adds to their lives. Next, we consider what your audience's primary Desire is. If they have identified their own problem in the first step, they may simply want to move away from that pain, but often your audience will have a corresponding desire that they want to fulfill. As an example, if your audience's main problem is that they are dissatisfied with their weight or fitness, it stands to reason that their principal desire may be to achieve a lean and well-defined physique that they can feel confident in. Once you have identified your audience's problem and desire, you can offer them a Solution that is specifically tailored to their needs. At this point in The Offer Bridge, you may or may not have a very specific solution in mind. Either way, you are well on your way to crafting a compelling offer for your buyers to take advantage of. We will refine this solution in the two remaining segments until it becomes an irresistible opportunity for your audience. The Market portion of The Offer Bridge focuses on where your product or service fits in the current market and what your competitive advantages are. As always, the key here is to focus on these questions as they relate to your customer. Of course, the first thing that we want to consider is what our Competition may look like for the problem we are solving. A helpful question to ask yourself here is, "what solutions has my audience tried before?". When you're thinking about who you are competing against, remember that you are fighting against everyone who is attempting to offer a solution to the problem. For example, if you are offering a brand new kind of weight-loss workout regimen to your audience, you are also competing with diets, weight-loss pills and supplements, and even liposuction. After you identify a few key competitors that your audience may have tried before, you need to ask "How have these other solutions failed them?" Every time a competing product or service fails to solve your audience's problem and help them achieve their desires, they leave you an Opportunity to create a better offer. This gap in your competitor's offering is where you find your market Advantage. To put it another way, this is where you refine your product so the it becomes a better solution for your audience than anything else that is available to them. Once you have convinced them that their doubts are unfounded, you can move them toward Revelation. This is where you get them to answer the one question where a "yes" means they will become your customer. If they can answer yes to "is [your offer] the solution to [my problem] and the key to achieving [my desire]?" then they are ready to buy. Once you run through the Offer Bridge with your product or business idea, you will have a pretty good idea of whether it is going to be a compelling offer for your audience or not. Offer Bridge Diagram and Worksheet?